You did your MA (at the Royal College of Art) in textiles, what made you change tack and decide to focus on paper? I don’t really see it as a change of direction. It was more of a progression as I was making mixed-media textiles anyway and using paper in embroidery. And in fact I haven’t really given up working with fabric as I plan to use it for an exhibition scheduled for the end of the year. What attracts you to paper as a material? I’m interested in materials that are cyclical. I like the fact that paper is made from trees and then after it’s used rots back into the soil again. It ties in with Buddhist philosophy and ideas about life after death which I came across when I was travelling in Thailand. I also like working with paper and its sense of fragility, although often the pieces are more solid than they seem. I like the way paper responds to your hand, although it is quite challenging to work with as it’s difficult to mould. 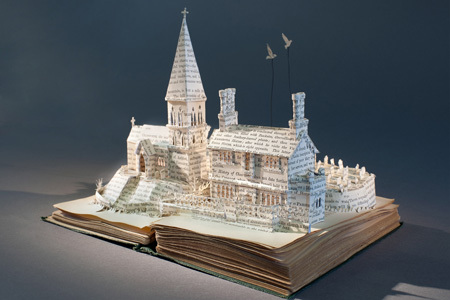 Can you explain how you first started making your book-cut sculptures? I bought the first book I worked with originally just as something to read. It was The Quiet American and I bought it in a second-hand bookshop in Thailand. It had obviously been read by a Thai person as there were beautiful, quite pictorial Thai inscriptions in the margin which gave it an extra dimension above and beyond the text. 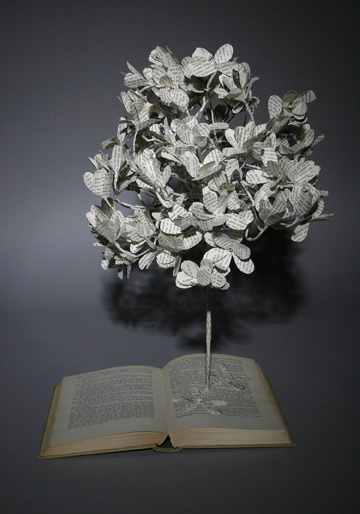 I sat on it for a while and then had the idea of creating a flock of butterflies escaping from the pages of the book. It tied in with a piece I was working on at the time called While You Were Sleeping – a dress with thousands of cut-out moths escaping from its skirts. It was based on the Burmese tradition that people’s souls turn into butterflies while they sleep and if you wake them up the soul doesn’t have time to return to the body so they die. Have any other artists influenced your work? I am particularly interested in Jonathan Callan’s work. He uses books and maps and atlases to make sculptural objects, but he is a builder and uses techniques like chiselling which are much more destructive than mine. 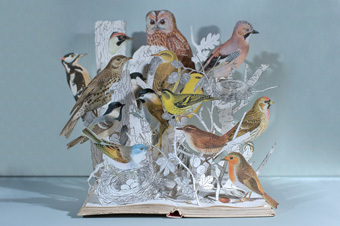 I also like the work of textile artist Anne Hamilton who makes quite repetitive multi-media pieces. It’s the repetitive element of her work which I like as I use that in my work – for example I always make series of trees. I don’t why I do, but it’s some subconscious decision as the trees keep coming back into my work. 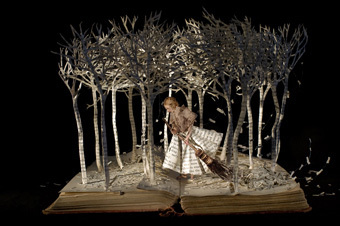 Your book-cut sculptures are full of narrative, where do you get the ideas for them from? I read a lot and either a particular story or illustration will grab my attention. I mainly use fairy tales, particularly those by Hans Christian Anderson and the Brothers Grimm, and I enjoy bringing out the grotesque side of the story. I also go back to childhood favourites such as Alice in Wonderland. The stories I chose to work with normally have a melancholic feel which I try and translate into the work – the characters often seem to be lonely or sad and tend to be escaping from something. They also have an element of mystery and I don’t like to give too much away. But although the pieces are quite literary, they aren’t a straight re-telling of the story – they are my interpretation of it and contain a lot of my own emotions. How do you actually make the pieces? They are very time-consuming to make. I don’t really plan the pieces before I start and don’t really know where I’m going with them. Sometimes I cut out an image and then the piece grows from that as I let the material guide me - you can’t force the paper to do what it doesn’t want to do. The shapes are handcut with a knife and then are supported using card and glue to make them into three-dimensional objects. I don’t really want to talk about the process too much as I like to keep it a secret. How do you describe your book-cut pieces? They are sculptures. Although I come from a textiles background working in three dimensions is very important. 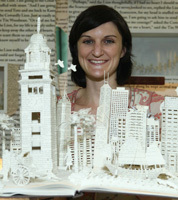 And I use sculptural techniques as I am effectively carving the paper to create the pieces. How do you hope to develop your work in the future? I’ve been working on book work for the last three years and I still really enjoy it. But I am interested in doing some larger scale pieces – my exhibition in Scotland will have some bigger pieces, although they are still based on the idea of taking something that isn’t an art object and turning it into one. There will be two dress installations there based on poetry I’ve read. I am also doing a residency at the Bronte parsonage in Haworth next year and I hope that will open up new avenues – I would like to do something site specific there and quite large scale although I might not necessarily do it in paper as I might go back to working with textiles.